My name is Leah and I am addicted to lip balm. No really, it’s true. I have lip balm stashed in every purse, coat, desk drawer, toiletries kit, suitcase, back pack, bathroom drawer and nightstand not to mention my car, my hubby’s car and several other places I can’t even think of right now. On the old very-popular TV show Survivor the contestants were allowed to bring one luxury item from home. My pick would have been lip balm hands down. I can’t even think of a 2nd choice. Sweet Almond Oil—Rich in vitamin E, A, B1, B2, and B6, it effectively balances the moisture levels in dry and irritated skin. Cocoa Butter—a remarkable emollient that is high in vitamin E which aids in skin repair and is high in anti-oxidants which protect skin from damaging toxins. Shea Butter—has anti-inflammatory properties and is easily absorbed into the skin. It is great for treating dry, cracked or aging lips. Vitamin E–a powerful anti-oxidant that protects and repairs your skin while restoring elasticity and softness. Raw Honey—high in anti-oxidants and very anti-microbial, it is a great anti-aging agent and moisturizer. Peppermint EO—cooling to the skin, promotes clear breathing. Ever wonder why you have to apply lip balm more than once a day? Well a lot of it soaks into your lips and the rest of it you basically eat. I only use Certified Pure essential oils that are pure enough to take internally and in the case of lip balm you will (take them internally, I mean). Whatever brand you use make sure it says For Dietary Use on the bottle. In my other melt-able recipes like Miracle Skin Salve I use a pint mason jar in a pot half filled with water. But with lip balm you have to pour it into those tiny tubes so I recommend using a glass Pyrex measuring cup if you have one. The spout makes the job a lot easier although you will still want to wipe the spout clean with a paper towel after each pour. Since the beeswax takes so much longer to melt, it’s a good idea to let it melt first and then add the ingredients that melt faster. Heat can diminish the benefits of a lot of these ingredients so you want to heat them just enough to melt them. Vigorous stirring will help ingredients melt, even at lower temperatures, so get your work-out on! I love a tinted lip balm for when I want to look a little more put together and the solution was easy. When you get to the end of a tube of lipstick you’re not really at the end. There is a surprising amount of lipstick still in there. I dug out the bottom of two lipsticks and added them to the melted mixture. One was Clinique Black Honey which I love (shown in picture) and the other one was Burt’s Bees Lip Shimmer in Raisin which I don’t love. A popular magazine said it would look fabulous on everyone but apparently they meant everyone except me. By using the two different shades and diluting the color in the lip balm I knew I would end up with something pretty. The BB Lip Shimmer was hardly used so I just cut off a chunk about an inch long and I saved the rest for next time. The color will always be quite sheer when you use this method but it is perfect when you want the benefit of lip balm plus a little hint of glamour. 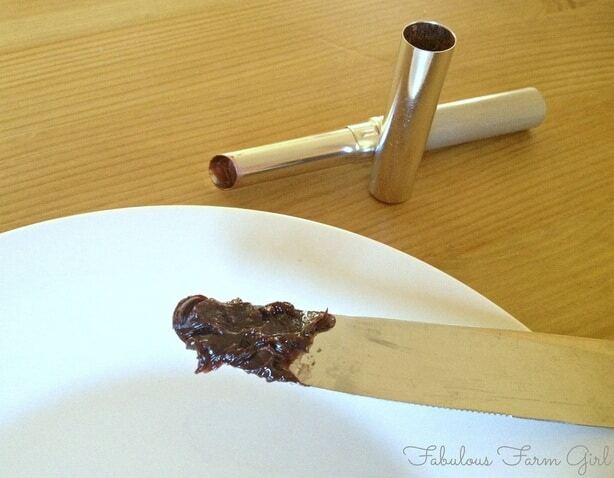 Now you’ve reached the hard part–getting the melted mixture into those tiny tubes. You can order a lip balm tray online which does cut down on the mess but a steady hand, some faith and a trusty rubber band can go a long way. If you get some drips, like the one in the picture at ten o’clock, just carefully wipe it off with a napkin. Let them sit for several hours until set before putting on the caps. You can make a cute label if you’re into that sort of thing and if you plan on giving any away as gifts I highly suggest it. I have been using my homemade lip balm for almost a year now and I love it. Every once in a while I find one of my old, cheapy lip balms in some random forgotten place. I immediately replace it with one of my new, all natural lip balms and it makes me so happy to have an addiction where the only side effect is soft, kissable lips. Pucker up! Place beeswax in glass measuring cup and place in a pot half-filled with water. Bring water to a boil and stir frequently until beeswax is almost melted. Add almond oil, coconut oil and cocoa butter and continue stirring until mixture is melted. Turn off heat, remove jar from pan and place on a dish towel covered counter. Immediately add shea butter and stir until melted. Once fully incorporated allow mixture to cool enough that you can touch the jar comfortably for at least 5 seconds. Add vitamin E and honey and stir until everything is melted and combined. If necessary you can put container back in the pot of warm water to facilitate melting but don’t turn on heat. 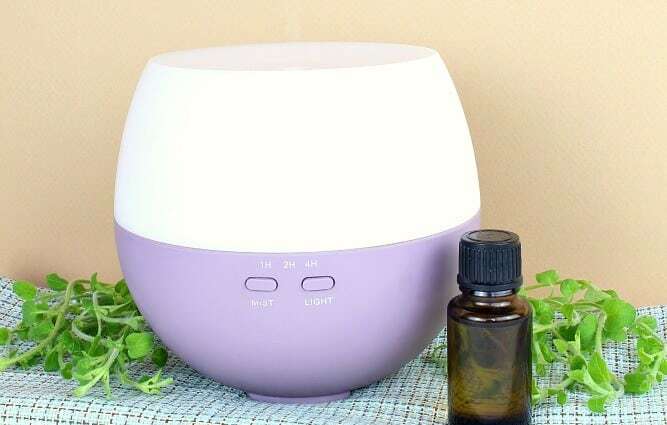 Let mixture cool enough that you can touch the container for 10 seconds then add the peppermint essential oil. Once fully combined carefully pour mixture into lip balm tubes, stirring well after each tube is filled to keep honey incorporated. Let cool undisturbed for several hours or preferably overnight. Cover with lids. *Note–I only use essential oils that are Certified Pure. Whatever brand you use make sure it says For Dietary Use on the bottle. Like I already said, you will be eating it. UPDATE: I’ve had a few people ask for a replacement for beeswax either because they are allergic or vegan. Find my suggestions HERE. Would you do this for one of the Daniel Ward RS activity nights? I know Vidya–it’s kind of amazing how much you can do yourself if you just try. Have fun! Great recipe! I *knew* you could make lip balm… I’d just never really thought about it. But with a six-year-old who’s sort of addicted to the stuff (not as bad as you, maybe, but then there’s time!) I am f-o-r-e-v-e-r buying those $4 Burt’s Beexwax tubes! Not cool! Oh I feel for you Christine! LOL. Hopefully you little darling is better at remembering where the lip balm got stashed then I am. At least 10 tubes should last you a while! Thanks for stopping by! Oh, this is really neat. I just paid $3 a piece for lip balm. A great gift idea too! Thanks. Pinning. Your so welcome Kathleen! And I love the idea of giving them away as gifts. 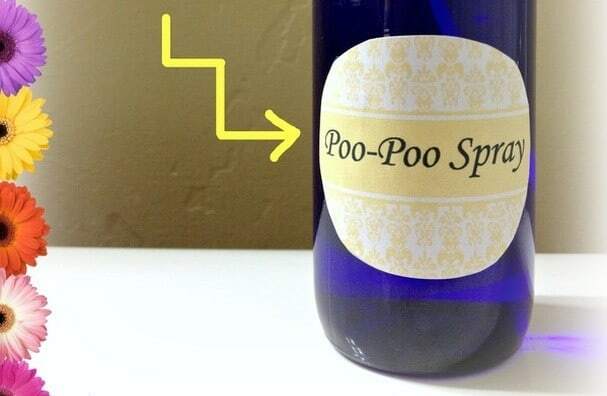 Now I’ll have to make some cute labels. Come back soon. This looks wonderful-thanks for sharing! Pinned and trying! Nice post! I’m going to give it a shot. I was wondering where you got your shea butter from? 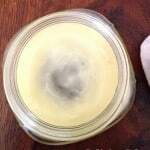 I’m having trouble finding a source that is really truly shea butter and not kpangnan butter. Thanks! Hi Kelly–thanks for your question. I order my shea butter from http://www.coastalscents.com. It is true shea butter, unrefined, from the nuts of the Karite tree. It is a light cream color and has a faint smokey, nutty fragrance. Kpangnan butter, or yellow shea butter, comes from the African butter tree which is a totally different species. 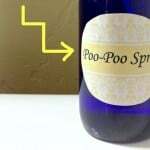 It is bright yellow, has a stronger smokey smell and leaves a drier feeling on the skin. It is cheaper to produce and is often sold in this country as “shea butter”. It is so common in fact that most people think shea butter is supposed to be yellow. Both products are very good for your skin and either could be used for this recipe but personally I prefer shea butter and certainly want to support companies that are honest in what they’re selling. I remember finding other companies that sold real shea butter online but Coastal Scents was less expensive. Hope that helps. You’re right Molly, lip balm is fun! Thanks for stopping by. You sound like you’re familiar with “Mary Jane’s Farm”, a great magazine for DIY women. I love that magazine. No, I’ve never heard of it Emma but I will have to check it out. Always looking for something fun to read. Thanks for stopping by. I would love to try making this with my teenage daughter and their friends. What a fun post. Thanks! And thanks for linking up to the Be.YOU.Tiful Link party! You’re welcome Jenny! My teenage sons never invite their friends over to make lip balm so I’m kinda jealous. Sounds like a lot of fun. And thanks for the link party–I’ll be back next week. Thanks for sharing your recipe! 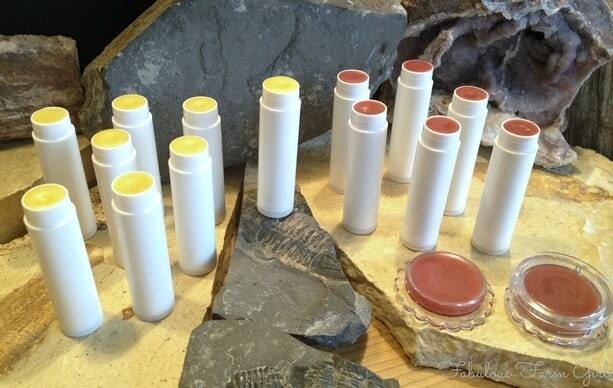 I have been making my own lip balm for some time now but never tried to tint it. I have a couple old tubes of Burt’s that are tinted that would work great since they are all natural. About how much of colored lipstick do you add to your recipe? Hi Tracy–thanks for stopping by. I used about 3/4 of an inch of my Burt’s Bees Shimmer lipstick and the color is very subtle. Next time I make this recipe I will use more, maybe even double that amount. The Burt’s Bees tubes are skinny so if your using regular lipstick than an inch would probably be fine but I agree with you that keeping it all-natural would be ideal. Luckily, I have more of the Burt’s Bees Lip Shimmer left since I only used it once. Also remember that my recipe makes 10 tubes so keep that in mind if you’re using a different recipe. Have a great week! Hi Kathy–thanks for your question. I have a friend who is allergic to beeswax so I already researched this issue for her. 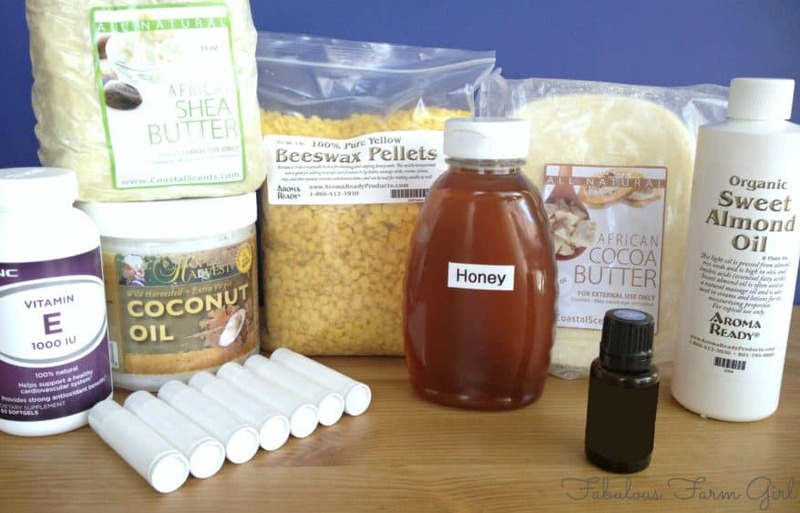 There are several alternatives to beeswax that you can use in your DIY beauty products. 1. Candelilla Wax–from the leaves of the candelilla shrub native to the southwest, this wax has the same lubricating properties as beeswax but is harder and much less pliable. Use half the amount called for when substituting for beeswax. Same price as beeswax but you’ll use half the amount. 2. Carnuba Wax–extracted from palm trees that grow in Brazil. I’m a bit wary due to the environmental problems caused by palm oil production. Like candelilla wax, carnuba hardens twice as fast as beeswax, so reduce the amount of wax used in your recipe by at least half when replacing beeswax with carnauba wax. Price is higher than beeswax but again you’ll use half as much. 3 Soy Wax–while most commonly used in candles it can also be used as a replacement for beeswax in lip balms, lotions and other cosmetics. My concern with soy anything is that if it’s not organic it is genetically modified. 98% of the soy grown in this country comes from GMO seed. The other 2% comes from growers who don’t make wax. Not to mention 99% of all soy wax on the market contains other waxes like paraffin, bees wax and palm wax. That said, it has the same hardness as beeswax so it can be used in equal amounts in recipes. It is significantly cheaper than the other waxes but you get what you pay for. 4. Bayberry Wax–made by boiling the fruits of the myrica bush and skimming the vegetable tallow (it’s not a true wax) off the water’s surface. It is very hard and brittle so use half or even less than the amount of beeswax. It is quite expensive, hard to find and has a very strong, earthy, resin-like aroma that will not be covered up by other fragrances. There you go. Personally my choice would be candelilla wax which you can get at Mountain Rose Herbs, Amazon and eBay and likely your local health food store. Hope that helps. 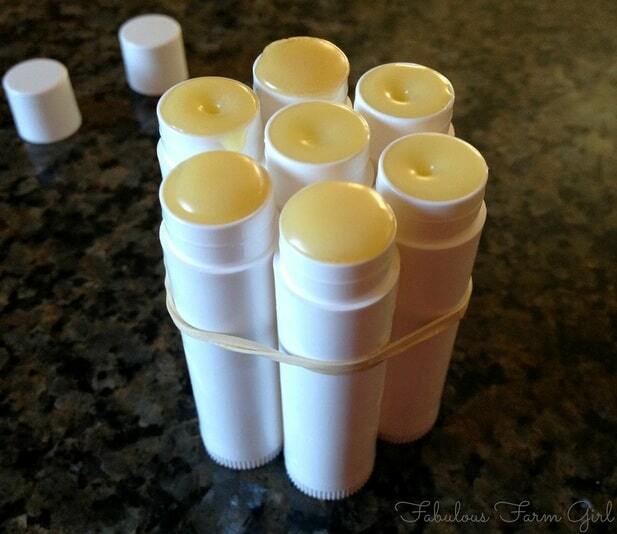 I absolutely LOVE lip balm and keep it all over my life so I love the idea of making my own! That’s awesome Julia! You can join my lip balm support group. You think you’re addicted now, just wait til you make you’re own. Your lips will thank you. have a fabulous week! So glad to meet another addict, Michelle! There are a surprising number of us. 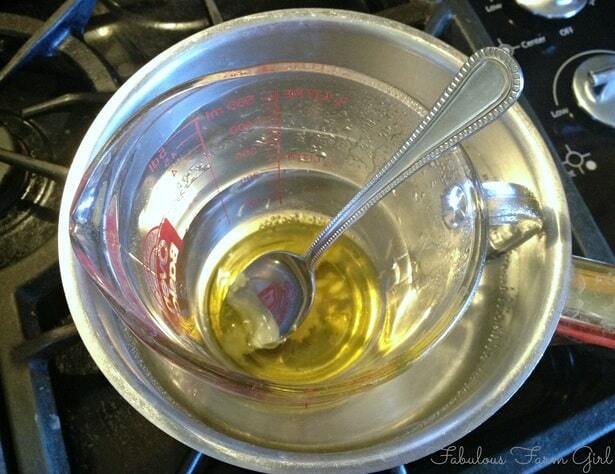 When I am cooking with olive oil (which is always) I often smear a little on my lips. Love your idea of putting it in a roller bottle. I have used honey as a facial but not thought to put it on my lips so I love that idea too. Plus you can feel good about eating it off. Thanks for stopping by and have a fabulous week! Thanks Honeybee–I love them so much I have them stashed all over my house and life. LOL! Have a fabulous week! This is awesome! I have a recipe for lip balm that I’ve been meaning to try too 🙂 Love it! That’s awesome Vanessa. 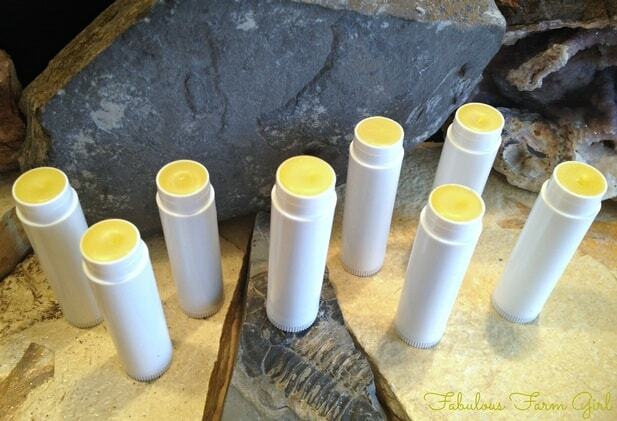 Once you make your own lip balm you’ll never go back to store-bought. I highly recommend trying it. Enjoy! Thank you.where did you get your bees wax? Secondly, my daughter is allergic to tree nuts. Can I use a substitute for the almond oil in your recipe? Thanks! Absolutely. 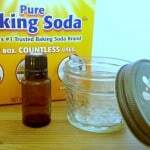 Substitute for any oil that it liquid at room temp. I like grapeseed oil, avocado oil, jojoba oil or my old favorite, extra-virgin olive oil. May I please ask where you acquire your EOs? I’ve been researching for hours and hours. I have some contacts for a certain MLM company and as of late, I have been purchasing from heath food stores. They are a long drive away, so I prefer the Internet for my ordering since I’m going to get most ingredients from Amazon. I have been making herbal tinctures and infusions for a couple of years. I liked your blog so much, you have inspired me to make your lip balm. Well I ended up getting the oil from a lady at a local farmer’s market. My Amazon order arrived today. Now I need honey from this weekend’s FM and the vitamin E from somewhere. Will be making on Monday. Can’t wait! 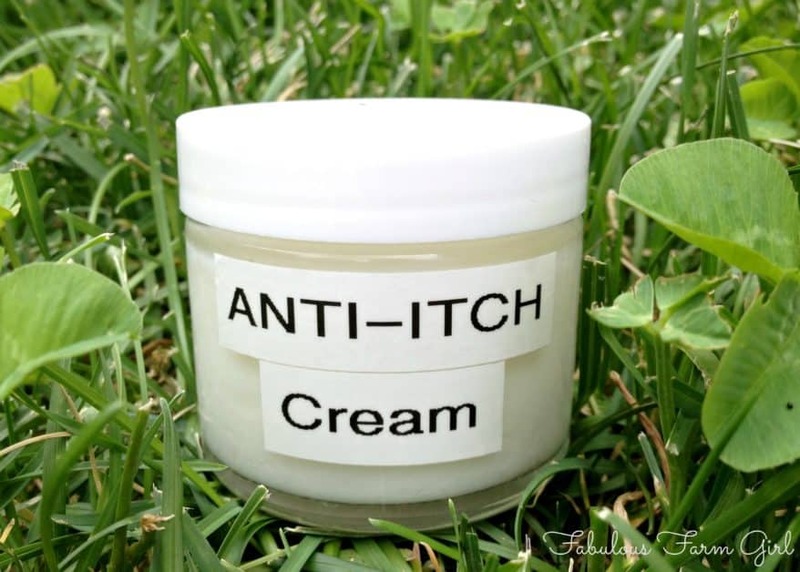 Do you have a suggestion for an alternative to cocoa butter (I’m out)? More Shea butter? Mango butter? Hi Melissa–you can use shea butter but since cocoa butter is brittle and shea is not you might want to add a bit more beeswax so it’s not too soft. Hope that helps!